During her law and sociology of leisure studies (ULB), Charlotte Messiaen continued her musical training at the “Conservatoire Royal de Musique de Bruxelles”. She then staed in Budapest to attend the Franz Liszt Academy, and studied the Hungarian music education structures, and discovers the world of choral singing under the direction of Gábor Ugrin. Since then, she has taught music in kindergartens and primary schools as well as in academies and trained many teachers. President of the Kodály Association of the Communauté Francaise de Belgique , she was Professor of methodology at the IMEP, Institut Supérieur de Musique et de Pédagogie of Namur and advisor to the Minister of Education between 1985 and 1988. In 1999, she co-founded of the ” Petit Conservatoire du Brabant wallon”, which is inspired by the example of Zoltán Kodály and has many children’s choirs. In September 2004, Charlotte Messiaen founded the “Chorale universitaire de Louvain” that she directed until December 2015, when handing over to Stefano Poletto. 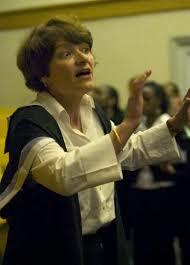 In addition to the Chorale universitaire de Louvain, she founded and directed for nearly 30 years the “Ensemble Vocal du Brabant Wallon”, the “chœur de jeunes à Louvain-la-Neuve », as well as the “Ensemble Vocal Kodály”, a female choir. She has also been directing the ”Petits Chanteurs de Sombreffe” since 2012, and is lecturer at the Senior University of Louvain.